I have never understood why the customs officer interviews people? We have already been allowed into the country by the immigration official. So the customs officers should have no need to interview us. Do you know why they do? I have to say Japan is the only country where this has happened to me. I think it’s quite rude. Would appreciate your opinion! Immigration and customs are two separate agencies and they carry out different functions. Immigration focuses on whether or not people are allowed into the country, while customs ensures that items that are prohibited or restricted do not enter the country. This is why customs interviews are carried out. I’m going to arrive at OKA from Taipei, then transit (ANA) to NRT, then (United) to IAD. What should I put for “Flight No./Vessel” in embarkation card? I can leave “Intended address in Japan” and “TEL” blank since my “Purpose of visit” is “transit”, right? Hello! On the embarkation card you will want to put the UA flight number – which is the actual flight you will use to leave Japan. If your transit includes a hotel stay then you will have to put your hotel information on the card. Otherwise I suggest getting in touch with your Japanese consulate regarding your transit questions. I have already been to Japan on two tourist visas this year, first from April-July and got approved for an extension from July – October. My fiancé whom I will be marrying in December is stationed at kadena Air base there. I wasn’t to come there and do my paperwork to get put on his orders so I can live there with SOFA because if I do the process here it will take months. My question is, if I try to come there around mid-December would I be allowed back in? My guess is that you would be ok for another 90 days if you enter as a tourist, but I think this question would best be answered by someone at the Japanese embassy or your local Japanese consulate. You don’t think I would get denied? And I I have ask immigration and they said that It would depend on if I had a good enough reason. My reason is to visit my family and hopefully get my paperwork done while there but the most important reason is to spend Christmas with my 6 and 9 year old daughters so we don’t have to be aprt for the holidays. I was just wondering if anyone or if you knew anyone who has been through this and if they had been able to enter or gotten denied. Unfortunately I don’t know of anyone that has experienced a similar situation. Sorry I am not much help… I hope things work out for you. But you do believe I wouldn’t have a problem entering for a third time? I will have my departure itinerary as well. 1. how easy is to go out for some hours and how hard is to came back to continue my travel with destination NZ? 2. it is enough time to do this short visit? My arriving day will be Sunday. I am thanking you in advance for your tip and trick advises. Hi Catalina! Thank you for visiting my blog! If you are interested in a tour around Narita City, closer to Narita Airport, there are desks in the arrival concourse where TRANSFER TOURS can be arranged. There are several places you can visit in the city, like Narita-san temple, and possibly the AEON mall and outlets as well. If you need to leave luggage, you should be able to go to one of the luggage delivery counters and they will hold your luggage for a small charge. Just remember to get back to the airport in time for your continuing flight! Good morning and many thanks for your reply. I will think what will be the best possibility for me to do, in this short time that I will spend in the airport. I will travel in early May to Japan, i wanna know whats the different between “Flights no/ vessel” in the left side and “Last flight no/ vessel” in the right? The last flight no/vessel on the form to the right is for the flight number or boat that you use to enter Japan. 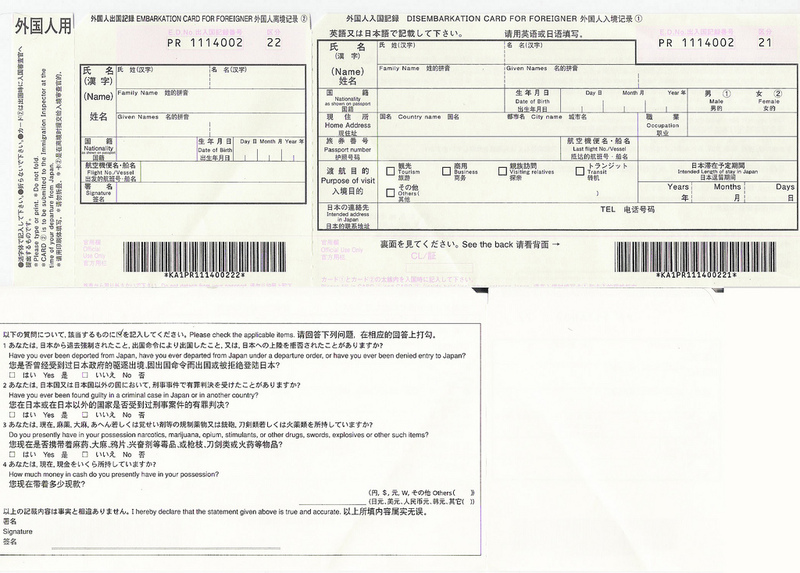 It is written on the disembarkation card that you hand in to immigration upon entering Japan. Your bags are subject to inspection at any time during the arrival process, in immigration or customs. Unfortunately, I cannot answer any specific questions with regards to immigration or customs. Please direct any inquiries to your local Japanese embassy or consulate. I can’t expand on what you can expect beyond the scope of the article, but I would guess you’d be subject to the same procedures as everyone else. Hello Jose, My 14 and 12 year old children will arrive in Narita Airport in a couple of weeks. There is no “unaccompanied minor” service I can pay for because they are older than 11, so they will have to go through immigration and customs alone. One is a US citizen and thus doesn’t have a visa. The other is a Chinese citizen and has a visa. Do you know if they can go through the same line in immigration? Also, do you think I’m insane for letting them do this alone? Their uncle will meet them as soon as they get through immigration and customs. Thank you!! Normally it is my policy not to address immigration and customs questions on my blog, as I am not very knowledgeable on these subjects. What I can tell you is that as long as your children are in Japan for the SHORT TERM, they can go through immigration but they will need to be processed one at a time. They *should* be able to go through customs together after claiming baggage. I am not well versed on situations concerning unaccompanied minors either, but regardless I would suggest contacting your airline to let them know about your children’s needs. You might also want to contact the departure airport, OR the arrival airport in Japan, to see what sort of assistance they may be able to provide. Sorry I can’t offer much help here, but thanks for visiting my blog and good luck!